RIO DE JANEIRO, Sep 19 2012 (IPS) - The Brazilian Commission for Combating Religious Intolerance (CCIR) condemned the film “Innocence of Muslims” as “disrespectful” of the prophet Mohammed, and organised a mass protest demanding respect for freedom of religion in this country. The organisation “repudiates any manifestation of scorn for beliefs or lack of respect for what is sacred to religions,” says a communiqué issued by the CCIR, an ecumenical group whose members include the Israelite Federation of Rio de Janeiro, the Espírita Umbandista congregation, Protestant and Catholic churches, and Muslim, Candomblé, Buddhist, Roma or gypsy, and indigenous groups. “The CCIR also stresses that it does not support violent stances, and that as a result of coexistence with the followers of Islam, it affirms the seriousness and respect that Muslims have for the preaching of love, religiosity and the values that help build a better world,” it adds. The film, produced in the United States by groups that have not yet been clearly identified, has also been repudiated by the U.S. government. It has triggered both peaceful and violent protests outside U.S. embassies in different countries around the world. Segments of the film posted on the internet portray Mohammed, the prophet of Islam, as a violent, corrupt, homosexual, philandering child abuser. “It is a highly offensive film that gratuitously offends Mohammed, depicts Muslims as barbarians and incites hatred,” Sami Isbelle, a member of the Muslim Beneficent Society of Rio de Janeiro, told IPS. The Society, which forms part of the CCIR, also condemned the “un-Islamic” reactions to the film. That route is being taken by the CCIR, which emerged in 2008 with the initial aim of defending religions of African origin from attacks, mainly by groups linked to neo-Pentecostal churches. 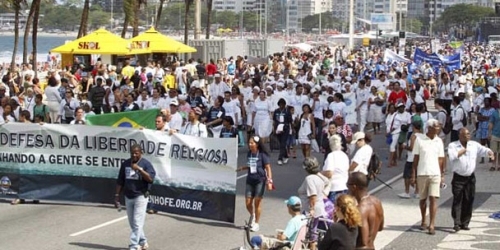 On Sunday Sept. 16, an estimated 200,000 people from 25 different religious groups gathered on Rio’s Copacabana beach in a march in defence of religious freedom, organised by the CCIR. The demonstrators called for an end to prejudice and violence against followers of other faiths, and called on the candidates running for mayor in the October elections to express a commitment to religious diversity. They also expressed their solidarity with the followers of Islam, in the face of the backlash against the movie. “No religion should be disrespected,” Maria Isabel Carvalho, who practices Candomblé, one of the religions of African origin in Brazil, told IPS. He mentioned a case in Brazil that he said was similar to the situation surrounding “Innocence of Muslims”. That case involved “The Second Son of God”, a film planned by comedian Antônio Renato Aragão, which he decided not to make given the reaction from Catholic and evangelical groups. In the planned film, the comedian was to play a supposed second son of God who would come to the world to complete Jesus’s failed mission. In this country of 192 million people, which has the largest number of Catholics in the world, that religion has gradually lost followers in the face of the growth of the neo-Pentecostal churches and the number of agnostics and atheists. The census shows the proportion of Catholics fell from 93 percent of the population in 1960 to 65 percent in 2010. Evangelicals, on the other hand, grew from four percent of the population in 1960 to 22 percent in 2010. Most of them belong to neo-Pentecostal faiths, like the Assembly of God or the Universal Church of the Kingdom of God. The proportion of people without any religion expanded from 0.6 to eight percent between 1960 and 2010. And in 2010, two percent of the population declared themselves “spiritists” and 0.31 percent said they were followers of Umbanda and Candomblé, although those who practice these faiths say they are under-represented in the census. Although religions with African roots are recognised in Brazil as an important component of the national identity, those who practice Umbanda and Candomblé are still the victims of prejudice and attacks. CCIR spokesman Ricardo Rubim told IPS that the organisation has received 118 complains of religious intolerance, some of which have involved attacks on Umbanda and Candomblé places of worship. Inácio Lula da Silva (2003-2010) established a National Day of the Fight against Religious Intolerance, on Jan. 21. Since then, different Afro-Brazilian groups have been pushing for approval of a national plan to fight intolerance, the enforcement of laws that promote respect for their faiths, and political guarantees and reparations for these groups, to ensure freedom of worship as established by the constitution. The government’s Special Secretariat on Policies for the Promotion of Racial Equality is in charge of working for such measures, and of registering all of the country’s Umbanda and Candomblé centres of worships and groups.